"...we at Handpoint know that, with a diversity of businesses, comes a diversity of workflows. We believe that your payments solution should fit your business, and even better, help you grow. 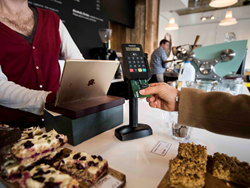 As restaurants and services have looked to upgrade their POS, many of them have had to sacrifice security in order to maintain their workflows and give their patrons the ability to recognize exceptional service. Today, Handpoint is proud to announce its new Tip Adjustment feature, giving greater flexibility and payments capabilities to service providers. Restaurants, salons, and other services now can accept integrated EMV transactions, and later adjust those EMV transactions for gratuities written by patrons on receipts. Building on Handpoint's robust Platform as a Service (PaaS), the new Tip Adjustment feature is yet another innovation for ISVs looking to offer the most sought after functionality, as well as ISOs looking to build integrated payment offerings for merchants. With customers having more choices than ever, merchants recognize that having the wrong payments experience is a significant business risk. In fast-paced, service-oriented environments, merchants are constantly looking for new solutions to create a more seamless and delightful customer experience. "Having had the opportunity to work with organizations of all sizes, from single-person operations to large international corporations, we at Handpoint know that, with a diversity of businesses, comes a diversity of workflows. We believe that your payments solution should fit your business, and even better, help you grow. By releasing pre-certified EMV tip adjustment on mobile card readers, we're enabling restaurants and services companies to upgrade security, increase sales, and streamline operations." To learn more about Handpoint's tip adjustment feature, please visit us at Handpoint.com or contact us today. Headquartered in Iceland with offices in the UK and USA, Handpoint is a next generation Platform as a Service (PaaS) provider to the payments industry. Handpoint has pioneered major innovations in the mobile payments market through its innovative PaaS solution, including developing easily integrated EMV payments, and has won multiple awards for the high pace of innovation in developing their end-to-end integrated payments migration platform.